The NewSpace Global 2017 SAR Satellite Report will soon be made available. This report reveals NSG's ability to combine historical analysis with accurate market and industry forecasting around the previously overlooked, but growing, Synthetic Aperture Radar (SAR) sub-sector. While the report covers larger satellites, the primary focus is on the emergence of smaller “birds” of the sub-500k smallsat class. Due to the complexity of this relatively new technology, NSG Analysts delve into the inner-workings of the physics behind SARsats and, within this context, compare the various competing or cooperating technologies such as LIDAR, optical imagery, and hyper/multi-spectral remote sensing. 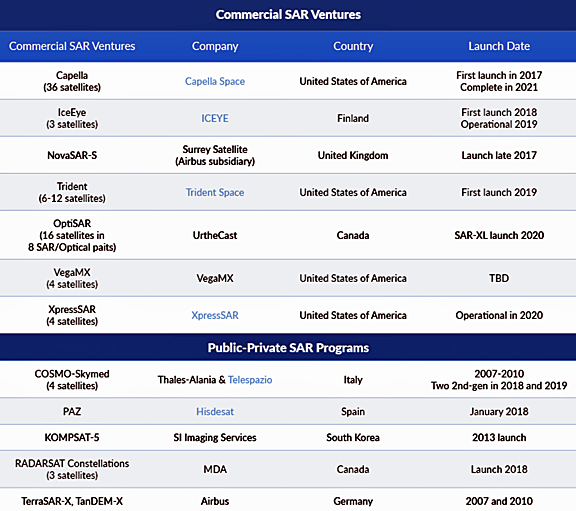 While the total number of commercially operated SARsats has been modest in number to date, NSG Analysts predict significant growth on the horizon and explore the various public-private partnerships, start-ups and established industry leaders examining how each is developing strategies to capture expected growth. In addition, the team explores the tens of millions of dollars in private capital raised by the growing number of emerging startups. Finally, the importance of artificial intelligence and the importance of machine learning is examined and articulated as it relates to the emergence of data analytics firms who are focusing on processing the tsunami of expected SAR generated imagery. Who are the fastest growing start-ups? What are the advantages and disadvantages of SAR compared with more traditional Earth observation techniques? Which players are best positioned to lead this sector?What are the initial target markets? What markets and applications will likely emerge in the future?